In these days of online brand adoption where speed is of the essence and scaling is what tech brands most need, creating a movement is an essential for brands. Movements need leaders (the brand owner or CEO) but more importantly they need followers and early adopters and mavens who will ignite the movement. 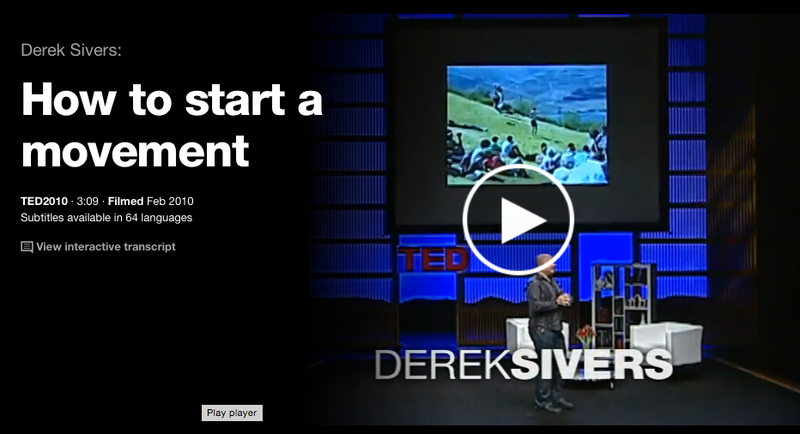 Here’s a great example of one from Derek Sivers’ TED Talk. One of the things I do a lot is write marketing and business awards entries. So I was delighted this morning to read the shortlist for the Scottish Marketing Star Awards. Without betraying confidence or going into specifics my papers garnered 11 nominations and 5 indirect nominations across 5 different clients and case studies. Obviously most of the credit goes to the work but that doesn’t always translate into goods stories and good stories is what attracts the judges. It was tough writing all those papers in Jan/Feb but seems to have paid off.